Nice thought, but he never really left. Earlier this week, as Graves pondered restaurant choices for his Oregon women’s basketball team, you’d think he was still commuting to Eugene from the South Hill. That’s a fair question, because the Duck women have quite a following these days. An Elite Eight team last year, Oregon is looking for even more this weekend in Spokane, starting with Saturday’s NCAA Sweet 16 game against Central Michigan. Credit Graves, who has rebuilt Oregon from the ground up – the same way he did at Gonzaga during 14 seasons. Within four years, Graves turned GU into a regional power. National notice came at the Arena, where the Zags won some of their biggest NCAA Tournament games and Graves drew the attention of bigger schools. He resisted until signing on with Oregon in 2014. Four years later, Graves hopes GU fans understand. Then he lobbied for their support. And why not? Eight hours apart, the schools seem much closer. Gonzaga men’s coach Mark Few is an Oregon grad, and almost was lured back in 2009. Meanwhile Graves was raising a family on the South Hill and building a winning program at Gonzaga. After taking Saint Mary’s to the NCAAs in 1999, he was hired at GU by athletic director Mike Roth. Graves bought into the vision, then tried to look past the wreckage: GU won a combined 13 West Coast Conference games over the previous half-decade. “When I first got there, it was a broken program,” said Graves. His first team, in 2000-1, went 5-23, leaving even the self-confident Graves with a few doubts. “At times you question yourself as a coach, and you ask yourself, ‘Did I make the right move?’ ” Graves said. Three years later the Zags were in the NIT; in 2007, GU was in the NCAAs for the first time. “You take your lumps, but once we got it rolling, it was a machine,” said Graves. Graves and his staff hit their stride in the mid-2000s by signing future all-WCC performers Stephanie Hawk, Jami Schaefer and Heather Bowman. The machine was even better than the sum of its parts, partly because of Graves’ outsized persona. “Some people shy away from it, but he embraces it,” Fortier said. In turn, the GU community embraced the team. From a few hundred in the Martin Center, crowds grew into several thousand at the new McCarthey Athletic Center. 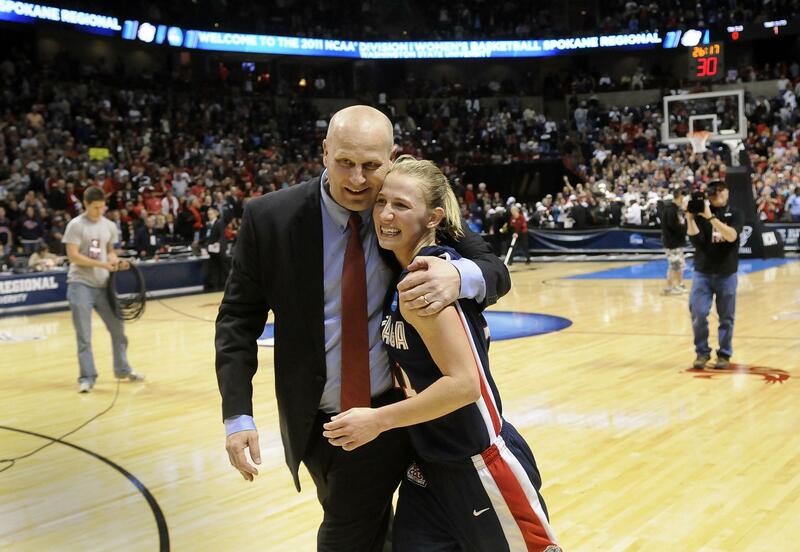 By the fall of 2008, Graves had the ultimate Zag in All-American point guard Courtney Vandersloot. But Graves didn’t, despite offers from bigger schools, notably Washington. The Zags made a Sweet 16 appearance in 2010; the next year they won 31 games and a spot in the Elite Eight with Vandersloot, Kayla Standish and Katelan Redmon. As the community embraced Graves, he repaid the favor. Every Halloween, he and his family created the best haunted house this side of Scarywood out of his three-car garage. Graves carried that spooky tradition to Eugene, but returns to Spokane for other rituals: weekends at the lake, Hoopfest and this year the NCAAs. Saturday’s game against Central Michigan will be Graves’ first at the Arena since he coached the Zags, and he wants their support. Perhaps a few signs wouldn’t be a bad idea. Published: March 23, 2018, 6 a.m.